Benchmark Books / Marshall Cavendish, 1999. According to Jewish tradition, this is the message that Abraham, the first Hebrew in recorded history, received from God some four thousand years ago. On this momentous occasion begins the recorded history of the Hebrew people. Did Abraham – who is also considered to be the father of the Muslim people – really receive such a message? Did he and his family really exist? This book explores the many journeys of the Hebrew people and the evolution of their belief in one god. Many illustrations as well as clear maps, a timeline, a glossary of Hebrew terms and a bibliography help readers find their way through the complexities of Hebrew faith and history from Abraham to the present time. Gr 6-9-Good-quality full-color photographs, reproductions, drawings, and maps combine with lucid texts to create informative and attractive research sources on ancient cultures. 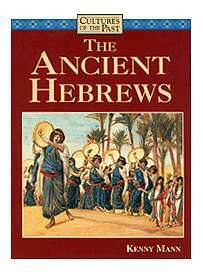 The Ancient Hebrews discusses the social and religious history of the Jewish people and its influence on modern Judaism, and touches on the relationship between present-day Israel and Arab countries. The way in which “The Ancient Hebrews” volume of the Cultures of the Past series is different from others is that the illustrations are mostly paintings rather than archaeological artifacts, which is particularly telling as to what centuries of dispute over the Holy Land have done to such treasures. In this volume Kenny Mann basically provides a historical perspective on the people and history of the Bible. Mann follows the standard five chapter format of the series in examining the history, culture, religion, daily life, and legends of the Jewish people: (1) In the Beginning deals with their history, from first arriving in the Promised Land to the triumph of the Romans; (2) A Living Faith covers their belief system, from God and the Prophets to the Torah; (3) The Tellers of the Tales provides a concise look at the Hebrew Bible and the Jewish tradition of religious scholarship as their cultural history; (4) The Universal Way examines the relationship between beliefs and society; and (5) Past,, Present, and Future deals with the legacy of the Hebrews from the idea of trade as a tool for survival in the Arab world to the nation of Israel. Obviously the chief attraction of this book for young readers is how it goes beyond the Bible to provide a look at the history and culture of the Hebrew people. The back of the book includes a time line of the history of the ancient Hebrews, a glossary, books for further reading, a bibliography, and an index. Other volumes in this excellent series look at not only the major civilizations of the past, such as the Ancient Egyptians, Greeks, and Romans, but also at civilizations that usually do not get near as much treatment in your standard World History textbook such as the Ancient African Kingdom of Kush, the Celts of Northern Europe, and India’s Gupta Dynasty.